I don't enjoy clutter and piles... but I have them. Plenty of them. This leads me to search for containers... buckets... and baskets to corral all those bits. Milk cartons work perfectly, and they're just sitting in my recycling tub waiting for a new life. It's much more fun to reinvent them myself than to put them out on the curb. 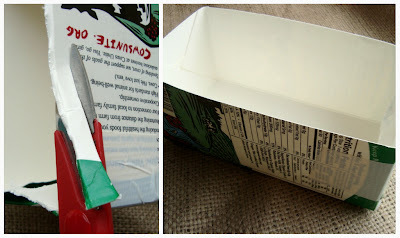 Here's an easy tutorial for creating your own containers out of milk cartons. It's probably obvious, but I'll give you a quick walk through, just in case. 1. Open up the pour side of carton. 2. Pop out plastic spout if it has one. 3. Fold sides down and tape shut with duct tape. 4. Lay carton on side and carefully cut out top of container with a knife. You're just about done! Trim off rough edges with a scissor and duct tape the inside of the side you sealed shut. It may look a little wonky with the tape, but the outside will be covered and the inside will be filled with your stuff. 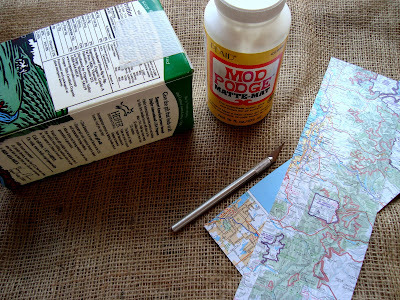 Choose some fun paper or fabric and cover the sides with Mod Podge before applying them. I used an old atlas so I had to use pieces. If you used wrapping paper, you could cut out one long strip. Because of their nice size and shape, these containers would be great organizers on shelves and desks. I can see them in coordinated groupings. Perfect in a child's art space (wipe out clean!). Just right for a sewing nook. How about decorated by your child to hold little toys? The possibilities go on and on! Please consider uploading pictures to the maya*made designs flickr pool if you create one/several. I'd love to see your interpretations. Great idea! Thank you for the tutorial. Thank friends! Yes, that gorgeous stapler is from your lovely shop, Grace!! I'm overjoyed with it! 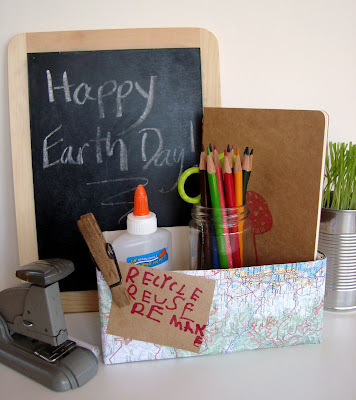 i'm a big fan of boxes and i love this idea! thanks maya! Very clever...very cute and practical. This is brilliant!!! I often use them standing up for markers (no sharp edges like tins) - just chopping the top off... but longways is so brilliant! Sometimes a different slant on things is totally inspiring... As for dragging things out the recycling I am all for it. Some weeks I think I take more out than the kids do! Also, use it to corral little bits of toys or kids art supplies. Or you could make it a shallow container for keys by the front door. Or in the sock and underwear drawer? How about covered with your burlap! It would be beautiful. Wonderful concept Miss Maya, simple and functional... I LOVE IT! I love that idea. I am going to have to use it. That would be a great way to sort Barbie stuff and make it cute and fun. I'm so glad I don't buy milk in bags! I have some crafts on the go that are in definite need of corralling right now. Of course, this will be a bit more mess before the organization but that's usually the way it goes for me. This is one of those things where people will be saying "Why didn't I think of that?!" I know I did. Thanks for another great idea! Another great idea! Did you see Oprah yesterday, where Jacques Cousteau's grandson was showing footage of the floating trash piles in the oceans around the world, one the size of the state of Texas? People need to wake the heck up. You're helping. Thanks. 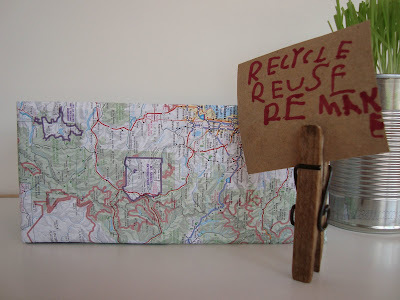 I love projects like this - I especially like that you used a map to cover it! I'm looking around my office calculating how long it will take my children to drink the half gallons of milk I'll need to corral just my office junk. (Hmmm. This should be one of those Everyday Math problems they give the kids at school. LOVE THIS! Would you mind if I reposted on my blog? If I promise to give all of the much deserved credit to you? Thanks! I'm glad you're all enjoying this one. Sometimes it's the simplest things that are the most satisfying. Amybluestar, I'd be happy to have you link over here. You can select a picture for your blog, too. After all, you're the Mod Podge Queen! When I was in elementary school, I made a milk carton school supply case. I had all my friends sign it and they all thought that it was a great idea. I love this idea, it's so simple and so useful. The atlas covering looks fabulous. We seem to get through hundreds of juice cartons, so now I can make hundreds of boxes! Hi, I just found you via Tiny Happy. What a great blog with so many great ideas!! oh how I love this! I'll be linking! 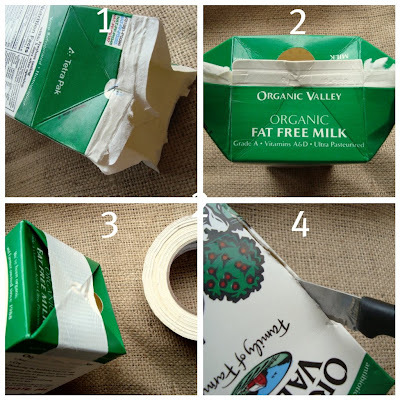 There are also other milk carton upcycle ideas on my blog. This is great! I love the look of maps for something so functional. I linked to this on our Three Sisterz facebook page. Thanks!! I love this tutorial and have been working on my own but I'm wondering how you got your paper to stick so well? I'm using a bunch of different scraps and having a hard time getting them all to stay. I used Mod Podge Paper and then just regular Elmer's Glue. Someone please let me know!